The possible site of a future Chick-fil-A. A Chick-fil-A fast-food chicken restaurant has been proposed for 7120 Little River Turnpike, Annandale, on the site of the now-closed Antiques & Art Emporium. 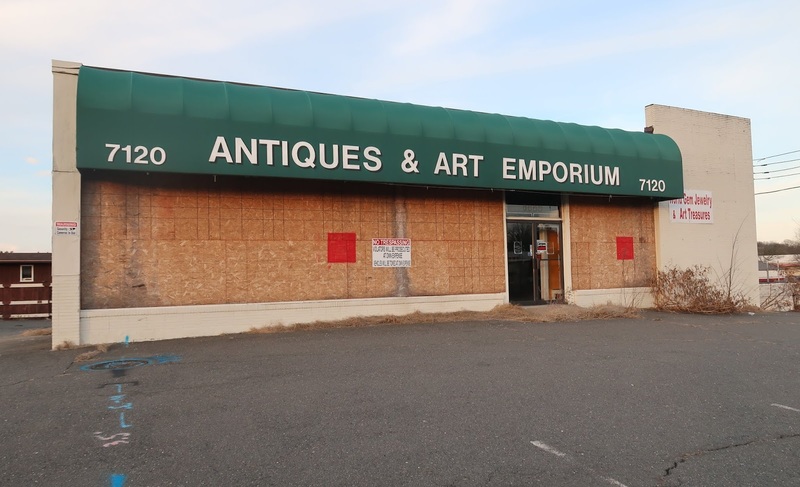 The several small businesses that had leased space in the antiques center had to vacate the building in 2017 after the landlord stopped maintaining it and the Fairfax County fire marshal declared it unsafe. Little Land LLC purchased the property from Patricia Riesett last June for $2.5 million. Little Land is seeking a zoning special exception to develop a restaurant with drive-through access on the 1.12-acre site. The Fairfax County Planning Commission has scheduled a public hearing on the rezoning proposal for Oct. 2. The Board of Supervisors hearing would be Oct. 15. As the proposal gets fleshed out, there is likely to be pushback from people who prefer a more comprehensive mixed-use redevelopment project in central Annandale rather than a stand-alone fast-food restaurant, as well as concerns about traffic congestion. Chick-Fil-A has about a dozen locations in Northern Virginia, including two new ones in Reston and Ballston. If the Annandale restaurant is approved, it isn’t likely to open until 2021, says A.J. Clemans, franchise owner of the Chick-fil-A on Arlington Boulevard in Seven Corners. There’s a lengthy approval and permitting process and the company has to select a franchisee. According to Business Insider, Chick-fil-A is one of the most successful fast-food chains in the United States, with $9 billion in sales in 2017, making it larger than Chipotle and KFC combined. It’s also one of cheapest to open, with franchisees only needing $10,000 to open a restaurant, reports Business Insider, but its franchise application process is highly competitive. The company receives more than 20,000 inquires from franchisee candidates a year and selects 75 to 80 who pass a lengthy interview process. According to Clemans, the company prefers franchisees who have successful experience in the restaurant business and are actively involved in their community. He had already owned a Chick-fil-A franchise in Ohio before buying the rights to the Seven Corners restaurant, which opened seven years ago. If Annandale does get a Chick-fil-A, it will compete with several existing chicken restaurants, including two that opened in 2018: Pelicana Chicken on John Marr Drive and Choong Man Chicken on Tom Davis Drive. No. We don't need Chick-fil-A anywhere, especially Annandale. The traffic is already hideous and their position on LBGTQ issues is not something we need, either. I'm all for this. I love CFA. We need real businesses with a potential to succeed in this area. So what do we do with that blighted area if not Chick-fil-A? Noone else has proposed anything and that area is an eyesore. Another fine dining establishment opening up in the Dump. Can't we do better? I guess the Donald will be helicoptering it in on Air Force One for a super sized fried chicken dinner. This is fantastic for two reasons. Chick-fil-A is a very good service-oriented restaurant for quick meals. And two, the present site is an eyesore, and the new restaurant will look much better. The fact that Chick-fil-A had gluten-free options that appeal to people with Celiac disease is another plus. Bingo. For the people who are whining about this, good luck waiting for something better to come along. "No. We don't need Chick-fil-A anywhere, especially Annandale. The traffic is already hideous and their position on LBGTQ issues is not something we need, either. " OH Yes, I see how these two issues are directly related. One can always hitch a ride with the Donald on his copter. Maybe Gross can get the Chick-fil-A Headquarters to relocate to the space where the Kmart was located. Then Annandale can become the chicken capital. Penny you go girl! At least it's not another Korean or Vietnamese restaurant. How many of those do we need in Annandale?? Now, let's get to work and get a department store in the closed KMart store where we can shop and not have to go to Tyson's or Springfield. Isn't there a Popeyes across the street? The "this is better than what's there" attitude hasn't resulted in any premiere development in the area nor is another fast food restaurant a great plus.